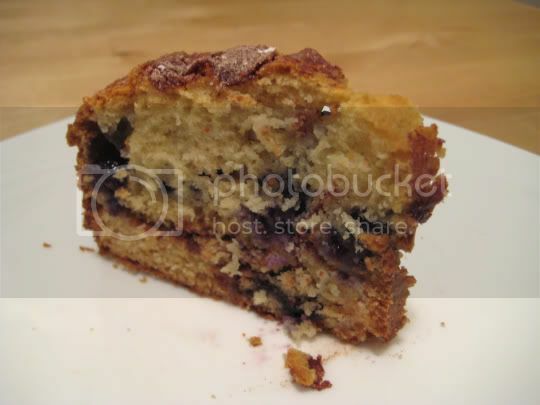 Mmmm, a warm slice of moist, dense cake rife with juicy sweet-tart blueberries and a sugar-cinnamon crunchy crust. The only thing missing from this morning masterpiece? The damn sugar! This was the most unsweet coffee cake I've ever tasted in my life. Only 3/4 cup was used, but I would have increased it to 1 cup had I known what the outcome was going to be. Don't get me wrong, it wasn't NOT sweet...just not sweet enough. An almost-bland taste hits your tongue with the first bite, and then the slight sweetness eventually comes out with chewing (sorry for the graphic bodily details). There is a separate sugar-cinnamon mixture aside from the actual batter: half of which covers the first half of the batter to create a sort of sugar ribbon, and the other half which covers the second half of the batter (picture layers). This cake also needed to bake a good 10-15 extra minutes to be done, but that allowed the sugar on top to give it a nice and crunchy crust. There's enough blueberries in here to allow one per bite of each slice, and at least that added a little more sweetness. Make again? Needs to be MUCH sweeter.